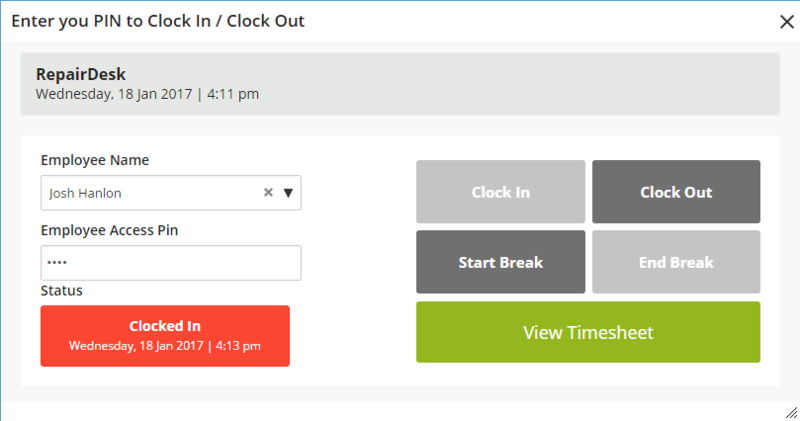 With RepairDesk's Employee Clock In/ Clock Out feature, your employees will get to clock in and out in the RepairDesk POS software via user access pin. It is a fast and reliable time-keeping add on. You’ll also know the hours everyone has worked. This would help you in calculating payroll. 1. Click on the top right corner of RepairDesk (where your email is displayed). Select Clock In/ Out from the drop down menu. 2. 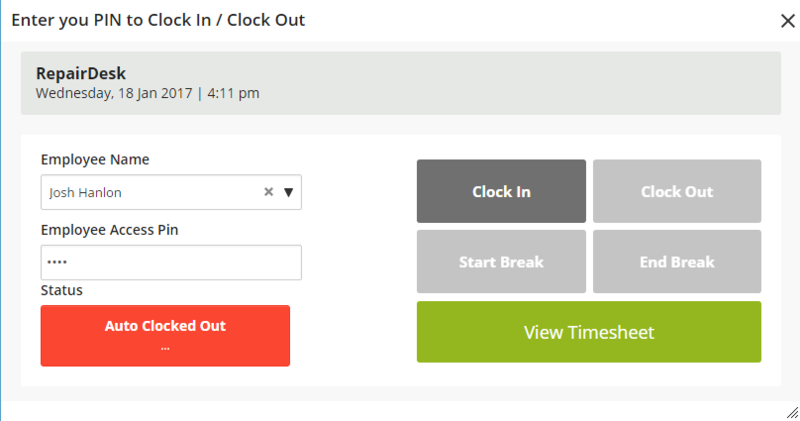 A pop up screen will open showing you the employee clock in/ out screen. Enter your access pin to unlock clock in option. 3. Click on clock in to mark that you have checked in. Your status will be updated as well showing the time and date. Also clock out and start break options would be unlocked and you can select one at a time. 4. Click on View Timesheet to view to see clock in/ out timings, break hours and total work hours of employee. 5. To print Timesheet, click on Action >> Print. 6. To update a record in Timesheet, click on the Update button. 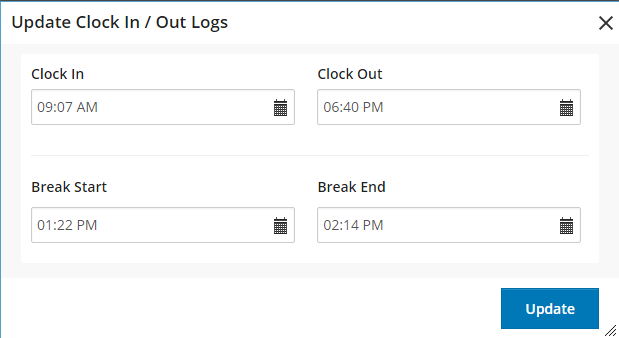 You can edit clock in, clock out, start break and break end to ensure that proper work hours are computed. 7. You can also apply filters in the Search Filter to narrow down your search; for example to see Steve's working hours and other details select Steve from Employee drop down in the Search Filter. 8. Click on Employee Payroll Report to view how much you have to pay an employee based on their working hours. 9. To view Payroll report, go to Reports, select a store from the Multi Store report, and under the Employee Reports section, click on Employee Payroll. A payroll report will open. Click on Action >> Print to print this report. 10. To edit an entry, click on the Update button against the specific record. A pop up screen will open in which you can update clock in/ out timings. Click on Update to save changes. Q. What is access pin? A. An access pin is a 4 digit pin for clocking in/ out in RepairDesk POS software. Q. How can an Admin update the access pin for an employee? 1. Going to Settings >> Employees >> Manage Employees. 2. Choose an employee and click on Action button against the employee and click on Edit. 3. In the Roles & Access section, enter the new access pin and hit Save. Q.How can I switch profile? A. You can learn about switching profiles from here. Q. How can en employee change his own access pin? A. If employee wants to update his own access pin: 1. He can go to Settings >>Your Profile >> Update Profile. 2. Under the Basic Information section, enter the new access pin and hit Save. Q. How is employee payroll calculated? A. First of all you have to set Employee Hourly Rate. To set it, follow these steps: 1. Go to Settings >> Employees >> Manage Employees. 2. To set the hourly rate for an employee, click on the Action button against it and select Edit. 3. Under the Roles & Access section, set the hourly wage rate in the Hourly Rate field. 4. Finally, click on Save button to save changes. Employee Payroll is calculated by multiplying an employee's Hourly Rate by the number of hours the employee has worked. Working Hours are calculated by the difference between the time when the employee clocked in into the system and when he/ she clocked out.